Scott Elmquist Inside the Jasper, the new Carytown cocktail bar and restaurant right next to Carytown Cupcakes. The freshly remodeled space is buzzing with equal parts elation and anticipation. At the helm are some of the city’s most familiar bartenders: former Heritage owner Mattias Hägglund, Thomas “T” Leggett formerly of the Roosevelt, and Kevin Liu, who owns the Tin Pan and Carytown Cupcakes. Also running around are bar manager Brandon Peck, who also worked at the Roosevelt, and food and wine director Jeremy Wilson, who joined the team after stints at Heritage and NASA. The guys are quick but meticulous with cocktail shakers as fellow restaurateurs and industry folk mingle and congratulate them over craft beverages. 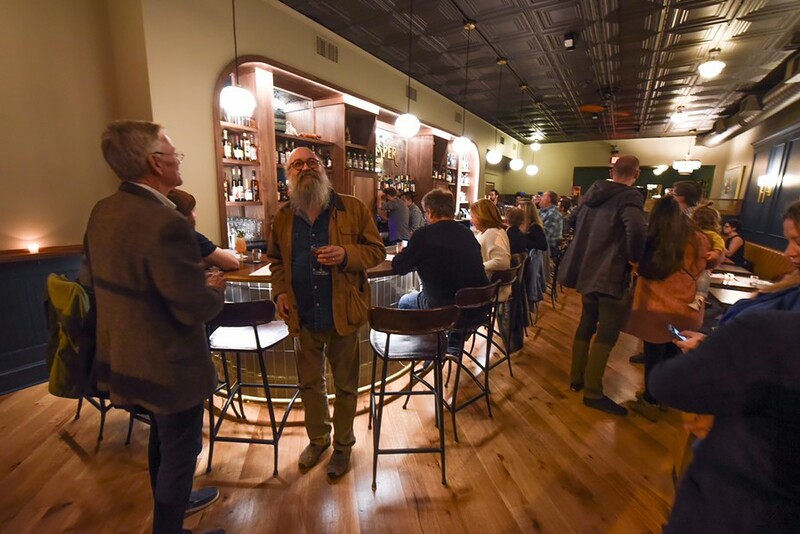 Welcome to the Jasper, Carytown's newest cocktail bar and restaurant, which officially opens to the public on Tuesday, Jan. 30. Those in the know have been waiting for these doors to open for months -- with good reason. These veteran bar guys announced plans to open the Jasper last fall and have since created an extensive drink list served up in a speakeasy-style atmosphere with black-and-white tiles and a jaunty, 1920s-esque logo. Every detail has been thought out, down to the stand-up comedy playing over speakers in the non-gendered restrooms. Front and center on the menu are 10 house cocktails, with each drink and description accompanied by a small icon displaying what it will look like. Several of the house cocktails feature tropical ingredients with surprising accompaniments, like the Blind Tiger (Jägermeister, banana, lime, grapefruit, bitters) and the Expat Willy (Scotch, orgeat, coconut, Jerry Thomas bitters, absinthe). Classics such as the Mexican Firing Squad (Blanco tequila, grenadine, lime, bitters) and the Hailstorm Julep (Laird’s apple brandy, Smith & Cross rum, port, mint) are also available. Don’t be afraid to order off the menu. Creativity and ingenuity go a long way in the food and drink scene, but so does the ability to craft a perfectly balanced Old Fashioned (not on the menu) - and theirs is delicious. The cocktails are the stars of the show, but there’s no shortage of other things to sip on. Six-ounce pours of house red and house white are available for $5 a piece, and the draft list features four beers (three from Virginia) and a dry cider. To pair with the drinks are a few “foodthings” such as the Saigon Sandwich (much like a banh mi, featuring hen liver pate and roast pork with pickled veggies, jalapeños, cilantro and kewpie mayo on a house-made baguette), French onion dip, pretzel bread with nori butter, and a bodega board of house-made Buffalo Creek beef jerky, Deer Creek cheddar, Marcona almonds and mustard. Located at 3113 W. Cary St. (right next to Carytown Cupcakes), the Jasper is open seven nights a week, 5:00 p.m. to 2:00 a.m.